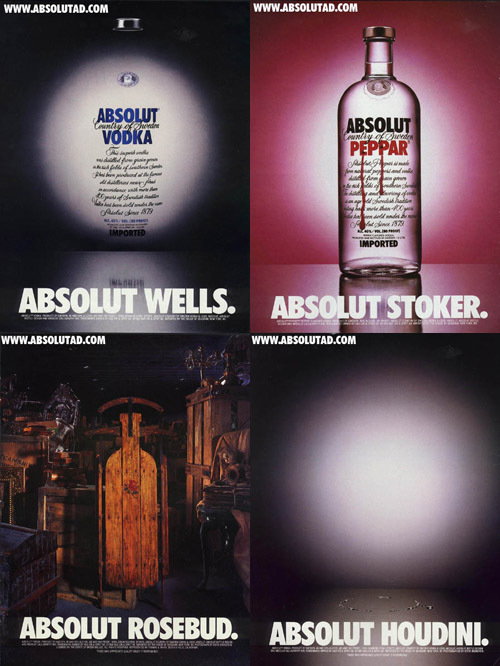 ADs made Absolut Vodka the most recognizable brand. 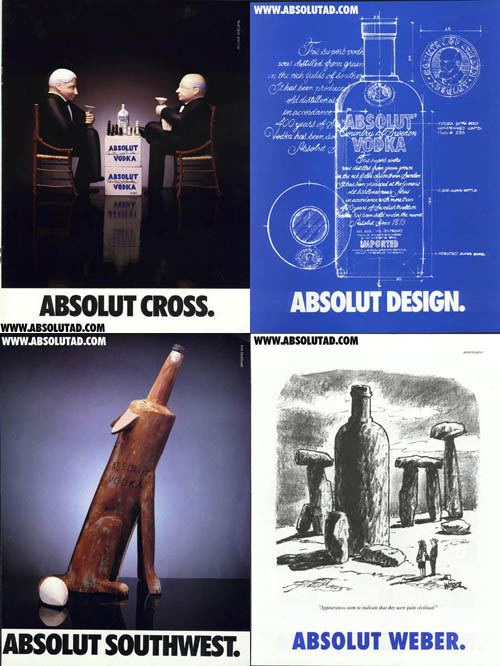 “Absolut advertising is celebrated not just for its longevity but also for its ingenuity. Readers tear out the ads and hang them on their walls. Librarians have to guard their magazines from being de-Absoluted. College student actually collect and trade ads. A SoHo antique shop hawks copies of ABSOLUT WONDERLAND, while a Madison Avenue newsstand carefully razors the Absolut pages from its stock and sells them for a few dollars apiece (naturally, selling the magazines as well). What’s going on here? 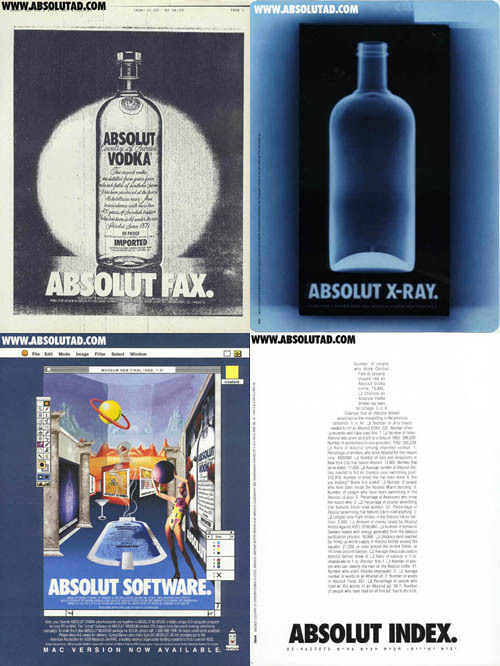 I remember buying a magazine just for the Absolut Ad when I was younger. 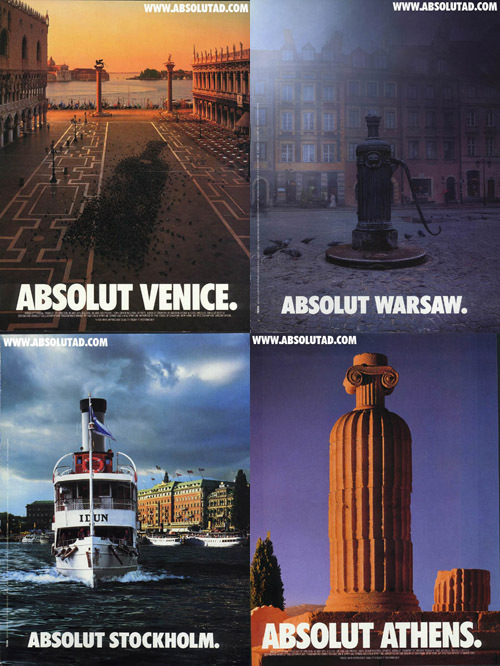 There’s a particular quality about the Absolut Ads that fascinated me. They were loud and subtle; worldly and intimate; retro and futuristic; aloof and sincere, abstract and explicit. Sometimes it seemed as if the whole campaign was a great art collection disguised as liquor Ads. 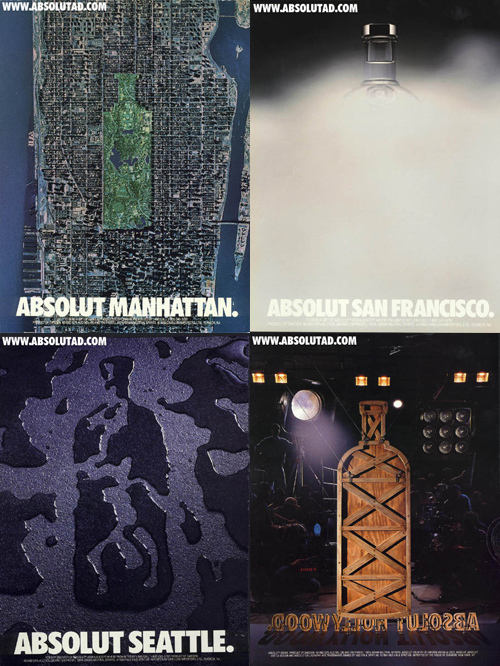 The Absolut campaign began in 1981, by TBWA. 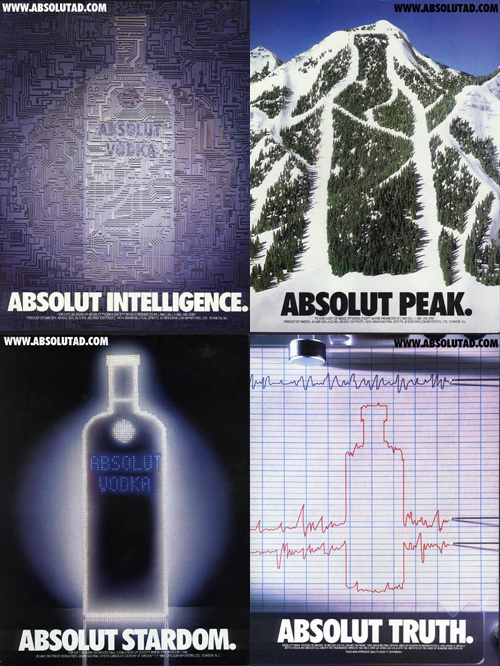 At the time, Absolut was selling 20,000 cases annually in the U.S., by 1995, the sales were over 3 million cases. I recently bought my second copy of “Absolut Book.” The first copy I bought in the 90s got lost after a few moves. This time around, I’m actually taking the time to read the stories behind the campaign, rather than being lost in the art. For Absolut fans, I strongly recommend this book and its sequel, fittingly named Absolut Sequel. The book is written by Richard W Lewis, the TBWA account manager who oversaw the brand’s campaign. He gives great insights on the beginning of the Swiss Vodka maker, long before the popular phrase “Absolut ____” started. He also gives behind the scene details on each mini series. The “Bottle Campaign” has long ended. It effectively served the purpose of establishing the brand. 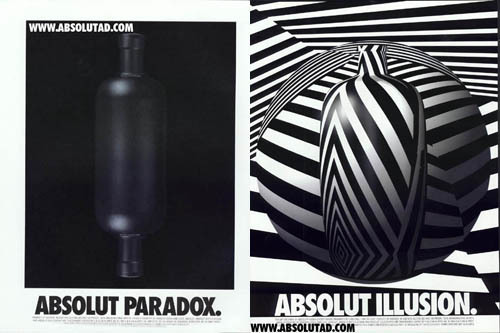 Now Absolut Vodka has moved on to other Ad campaigns such as “In an Absolut World.” Somehow, I’m just not drawn to it as the old one. Somewhere, the magic is lost and the new ads are forgettable to me. Really cool read! Definitely gonna check out the book… always loved the bottle ads… and as I recall… I can’t quite remember the last “Absolute” ad I have seen/read. Wether that is a results of the newer campaigns I am not completely sure. Thanks again for this nice snippet into the Absolute World. Aaron ‘n Janko, thanks! I wanted to expand on each of the mini-series in the book, but I didn’t want to totally paraphrase it. If you’re a fan of the campaign, definitely get the book. it’s great. Yes they’re brilliant. 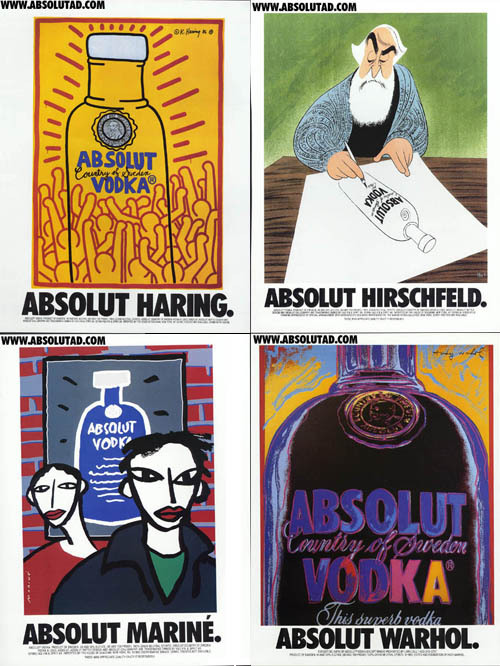 Funny thing, when I had a links blog running at where my photoblog is now located (the URL), I linked to an Absolut Vodka campaign and used an image of their product. For the next year until I got rid off it from my site the MySpace crowd just kept hotlinking to it in large numbers – which is a good thing if you sell a luxury item like alchol especially. They’ve obviously built a strong brand equity with their customers.